Unified Women’s Super Middleweight World Champion Claressa Shields spoke to media at a workout session in her hometown of Flint, Mich., before she departed to Verona, N.Y. to defend her 168-pound titles against undefeated IBF mandatory challenger Tori Nelson tomorrow night, Friday, Jan. 12 live on SHOWTIME. Shields will weigh in this afternoon prior to tomorrow night’s ShoBox: The New Generation telecast from Turning Stone Resort Casino. The telecast begins at 10 p.m. ET/PT and features the battle of two undefeated 140-pound prospects Shohjahon Ergashev and Sonny Fredrickson and Jesse Hernandez making his ShoBox return against Ernesto Garza. “I feel great. I really pushed myself this camp. It was a longer camp than usual so I’ve had ample time to get ready. 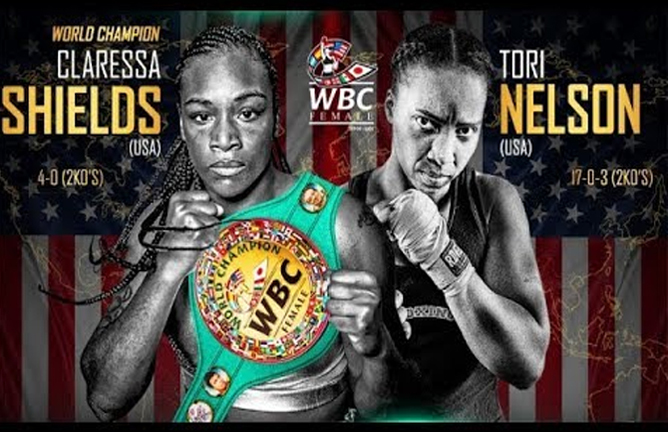 Tori nelson has been doing a lot of trash talking but I’m going to show her that she may be 17-0, but she’s never fought a girl like me before. “I may only have 4 professional fights to my name, but I have plenty of amateur experience. I’ve fought girls that are 16-0, I don’t see anywhere on her record where she’s fought an undefeated fighter of that caliber. “I’ve prepared for this fight the same way that I always do. I haven’t done anything special. I focus on myself, not my opponents. “In the 6th or 7th round, Nelson goes down.